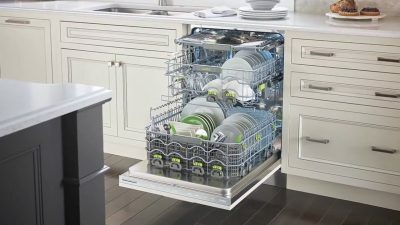 Home/Last News & Discounts/This advice will help your dishwasher live long and prosper. This advice will help your dishwasher live long and prosper. Among the most used and popular kitchen units today, along with an oven and a refrigerator, is a dishwasher. People prefer automated dish washing. When purchasing such a machine, you should be aware of a few rules that allow to extend its service life and improve the quality of work. Dishwasher contamination prevention is the first condition of operation. When the unit is first turned on, it is imperative that it be cleaned from possible manufacture contamination (factory oil, assembly debris etc.). To do this, a special cleaning agent is poured into the machine, and a single washing cycle is run on empty. This procedure for cleaning the dishwasher chamber and its elements should be regular. Once every 3-4 months, it should be carried out using one of the intensive cycle programs. The temperature should be quite high 140-158°F. such care products as Afresh, Glisten, etc. is popular. In fact, there are many similar products by various companies, thus choosing the right product will not be difficult. To clean the dishwasher, you need to use only the product specifically designed for it. It contains active substances that act on fat and deposits that bind contaminants. Every two years, it is necessary to clean the internal components of the dishwasher. This is a mechanical process and should be carried out by experts only. The unit is disassembled, parts cleaned and then assembled back. Such operations can only be done by highly skilled craftsmen who know the internal structure of the machine. 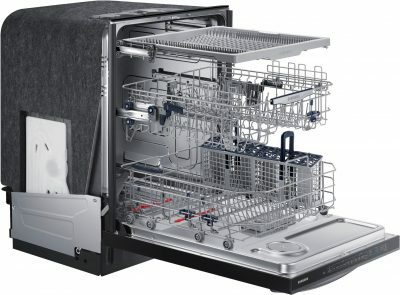 To extend a dishwasher’s service, it is necessary to care for it properly. One of the most important rules is the following: only dishes properly cleaned from food leftovers should be loaded in. First, you must not be lazy to wipe household appliances daily both outside and inside (including the door) with a damp cloth moistened with a liquid detergent. Care should be taken when cleaning the control panel, as water that has entered its holes can seriously damage the machine. To complete this work, you need to wipe all the elements again with a dry cloth. If the unit is made of stainless steel, special cleaning agents are used to clean it. filter is installed in place. The same actions are carried out with the blades from the shower of washing, but they are cleaned only if dirty. Then they should be simply removed alternately and cleaned. When installing the blades in place, the ease of rotation needs to be checked. If the rotation seems inhibited, the blades are removed again, and the axis is cleaned. The seal on the door should be cleaned of sediment once every 6 months. Buying a special tool for it is better where the machine is purchased. Some people clean the door seals with liquids intended for washing refrigerators. However, for a thorough cleaning of the internal components of the dishwasher, it is best to use liquids made specifically for dishwashers. place the dishes into the basket correctly, use holders if necessary. It is not recommended to a dishwasher on dishware with painted on the glaze, with mother of pearl, or items made of aluminum, wood, or silver.